Christmas Magic - A Visit To Fleming's Christmas Tree Farm! When it comes to creating Christmas memories and magic, it’s hard to top a visit to a Christmas Tree farm! Christmas tree farms are an iconic part of Christmas traditions that exist so many families. The smell of fresh-cut pine. A roaring campfire to warm the hands. Maybe even enjoying a mug of hot chocolate, or a cup of coffee. Nothing beats heading out into a forest of trees to find just the right Christmas Tree! And then, above all else, there is heading out on the land to find the perfect Christmas tree! Anyone who has ever been to a Christmas tree farm knows the excitement of finding “THE” tree. Heading out among the mini small pine forests to size up the trees one by one. Checking to see if it’s too small, too round, too tall – or just right. And then, of course, the family discussions of why this one or that one is the better choice! Whether its a pre-cut tree, a living tree, or finding and cutting one down as a family – heading to a tree farm is a big tradition for many families. It is a day that so many folks have fond childhood memories of, and now try to pass it along to their kids as well. Today, thanks to the recommendation of one of our readers from Pennsylvania, we are going to take a little photo tour to one of the magical places. Fleming’s Christmas Tree Farm to be exact. 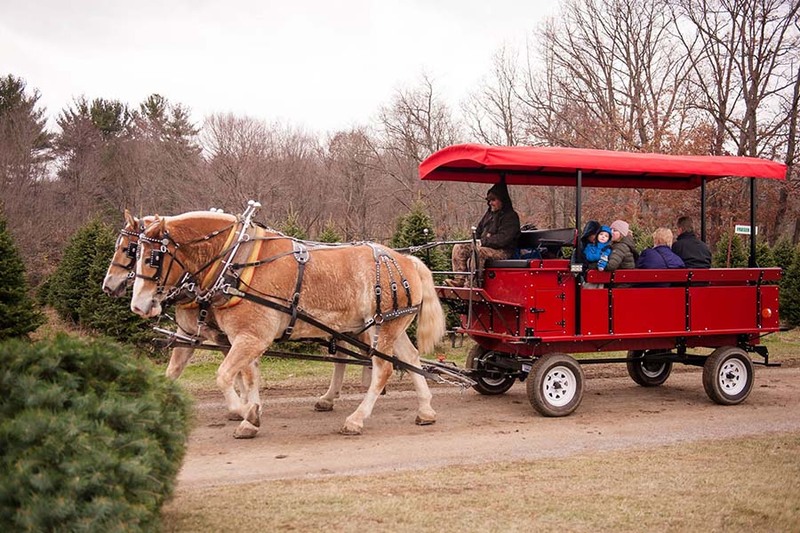 One of the horse-drawn wagons at Fleming’s Christmas Tree Farm in Indiana, PA.
At This Is My Garden, we love sharing with our readers the beautiful gardens, estates and farms that dot the landscape from sea to shining sea and beyond. And Fleming’s Christmas Tree Farm certainly qualifies on that front. Fleming’s is located Indiana, Pennsylvania. Indiana, PA is a beautiful town of about 15,000 residents, located about an hour and fifteen minutes northeast of Pittsburgh. Every year, in late November and into the December, the Fleming’s farm comes alive with the Christmas spirit. With over 10,000 Christmas trees to pick from, there really is something for everyone. Santa and one of his reindeer joining in on the fun. And of course, those 10,000 live trees out on their farm, just waiting to be cut down and find a home for the holidays. Whether it’s a Fraser Fir, Douglas Fir, Canaan Fir, or a gorgeous Colorado Blue Spruce, finding the right tree is as easy as getting the family to agree! Fleming’s Christmas Tree Farm’s gift shop – just in case you need a little something for that tree! At Fleming’s it really is an experience. And if you come during one of their Family Fun Weekends (November 23rd, 24th, 25th & December 1st, 2nd, 8th, 9th), there is even more magic in the air. They have horse-drawn wagon rides, a visit from Santa, and a Christmas shop filled with Christmas items to decorate any home. Everywhere you look – it’s Christmas! And you can tell by the photos that no matter the age, children and adults alike are having fun. You can feel the Christmas Spirit in the air! One of the great things about Fleming’s is their commitment to community. Fleming’s Tree Farm has been involved in efforts to donate trees since 2005. In 2005, the National Christmas Tree Growers Association developed an entity called the Christmas Spirit Foundation. A Trees for Troops program was started by the foundation, and focused on donating Christmas Trees to troops, and military bases here and overseas. In the first year, 4,300 Christmas trees were donated and distributed to five military bases in the U.S. and overseas. By 2016, over 193,237 trees had been donated to over 75 bases! In 2009, a local Indiana, PA group committee was formed to organize an event for the drive. Their purpose was to sell trees to be donated to the Trees for Troops program. In the seven local years of the event, over 2000 trees have now been donated to the program. A soldier helping out for Trees for the Troops Day. Fleming’s will host a drive again this year at their tree farm (1803 Fleming Rd. Indiana, PA 15701) on Saturday, December 1st, 2018, from 9 am to 5 pm. The event features Santa, live music, face painting, horse drawn wagon rides and more. And even better, the chance to meet and thank a soldier! Each tree donated that day has a special tag for donors to write a special message. It is just another thing that makes a visit to Fleming’s tree farm so special. Here’s to enjoying your own Christmas traditions this year with family and friends! This Is My Garden is a garden website created by gardeners – for gardeners! We publish two articles every week, 52 weeks a year. You can sign up to follow along via email below. Be sure to follow along on Facebook and Pinterest as well for our latest stories and pins. This article may contain affiliate links. August 4, 2018 TIMG Comments Off on How To Divide Perennials In Late Summer And Fall – Create More Plants!